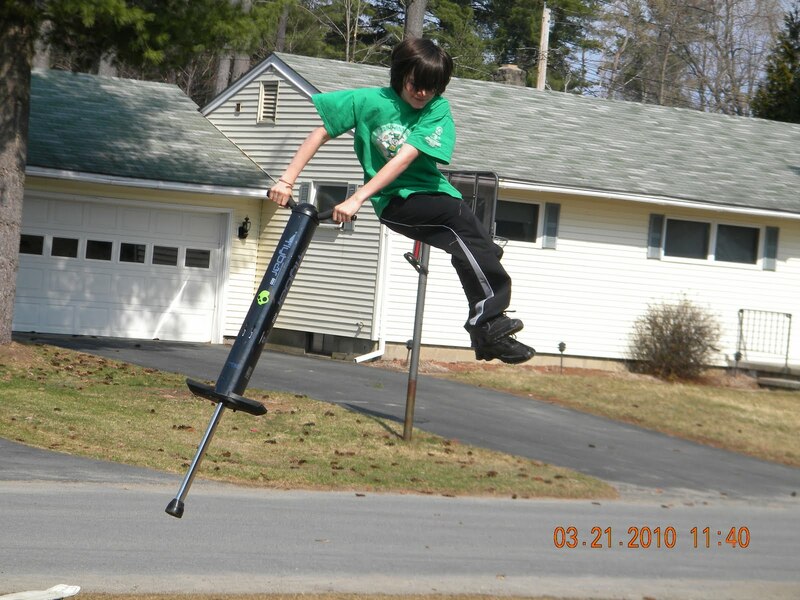 "Ma, is it okay if Aidan takes a picture of me jumping off the roof onto my pogo stick? The trick is called a "bomb drop," and I have to be able to do one if I am ever going to get sponsorship!" My hands gripped the counter's edge as I thought of a response to this LUDICROUS question. My first instinct was to use sarcasm. "Why of course dear. Let me hold the ladder for you. Better yet, our ranch's roof is too piddly. Why not travel to New York this weekend so you can jump off the Empire State Building!" But I have learned with Gannan that sarcasm never works. He knows the antidote-which is to pretend to take me seriously. His answer to said sarcasm would have went something like this, "Alright! Thanks mom!" At which point he would have ran outside to announce to all his neighborhood friends, "Mom said I could do a bomb drop off the Empire State Building this weekend!" And once again the adults living on our right, our left and across the street would shake their heads and wonder to themselves, "What kind of mother would let her son do the things that Gannan does?" What kind of mother indeed? In earlier posts I have mentioned how difficult it is sometimes to raise children in the small town in which I was raised. Like most small towns, this one has a gossip mill that churns out product on a daily basis. For some, this is just part of living in a small town. Some take it in stride. Some even relish it. Having been the gossip-product-of-the-year a few years back (for which I take full responsibility), it is something that I have come to fear. That's right, I am afraid of the gossip kings and queens of this hamlet for the damage that they wield with their rumorous swords. But the energy and fearlessness in Gannan has made it hard to hide from the know-betters of my community. He doesn't walk, he skitters. He doesn't sit, he jitters. He doesn't do slow, he scurries. He jumps, leaps, canters, bolts, scoots and skedaddles. As a runner, he insists on running races that typically only adults enter. He grabs the bumpers of passing cars to take joy rides on his skateboard. He uses his skim board to race down the iciest steepest hill on our block. He hurdles out of trees to land on a friend's bike that he has maneuvered underneath. He's a kid that you can't keep down, literally, even if you put a straight jacket on him. (Hey, now there's an idea I haven't tried. Hmmmmm....) Danger is his life, and every dangerous venture he embarks on is another chance for someone to say, "Where is that kid's mother anyway?" My husband, who comes from an even smaller town than mine thinks that I am crazy to let what others think taint the decisions I make about my own children. And intellectually I know he's right. But, I am finding that sometimes fear overrides intellect. Two things have happened lately that have got me thinking that perhaps I should stop the incessant fretting of what others think and just let Gannan be his irrepressible self. The first inspiration came from this year's Winter Olympics. Gannan and I were watching that bubbly Shaun White attempt the "Double McTwist" (snowboarding two twists and three and a half spins while on a halfpipe.) He, of course, landed it and went on to win this year's gold. At that very moment, Gannan turned to me and said, "Thank God his mother never told him that he couldn't try that trick. Right mom?" I looked to my husband who immediately shrugged in a "don't-ask-me" kind of way. I had no answer to this question. Well, no answer that I could defend. Gannan was right. Had Shaun White's mom been like me, he'd never have been the gold medalist that he is today. I knew that Gannan had aspirations to get sponsorship for his pogoing. I also knew that he had to be able to do certain tricks in order to get that sponsorship. 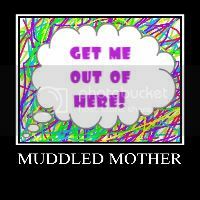 Wasn't it my job as his mom to help him find ways to do that safely as I am sure Shaun's mom did for him? Last week, I got a local gymnastics club to agree to let him use their facilities on Saturdays so he could practice the necessary tricks with at least as much safety as I could find. Shaun White's mother would approve. You will be SHOCKED when I tell you where the second inspiration came from. After all my belly aching, it pains me to admit, but it actually came from a neighbor. Now granted this neighbor is the Pulitzer Prize winning Mark Mahoney, but a neighbor no less. On Thanksgiving he wrote a column on what to be thankful for in a year full of hardships such as this one. To our surprise he wrote about Gannan's exuberance as a reason to feel gratitude. The editorial takes the stance that when life pulls us up short we should look for the things that make us feel joy, like watching my son's lust for life. Mark said, "Life can be tough sometimes. Often, it's overwhelming. And it's simplistic to think that watching a kid on a pogo-stick is going to pay the electric bill or cure an illness. But without these little things to break up the monotony, life's pressures would be unbearable. These are what get us through the long days, the tough times. Without them, life would totally bring us down." I have to admit, until reading that editorial I would have said that Gannan's Energizer Bunny like personality would have been one of those things that I categorized as a "life pressure." But Mark's thoughts made me question that. Could it be that the eye rolling of my neighbors was just my perception? Do they see Gannan in the same way Mark sees him? In reality, shouldn't I be joyful that my child loves life? I am still in the process of working out the answers to these questions, but there are many days lately that instead of closing my eyes, I go outside to marvel at that little boy of mine flying on his beloved pogo stick. "Great mom!" Said Gannan after reading this blog. "Does that mean I can jump off the roof now?" "Oh sure dear. Let me hold the ladder for you!" Below are two links that I'd love for you to visit. One is a You Tube video of Gannan on his pogo stick doing back flip dismounts. I'd like to state for the record that this was filmed at his dad's house, and that I had no say in the absence of the helmet...sigh. The other link is Mark Mahoney's editorial about Gannan. Enjoy! This is my favorite to date. I love the descriptive paragraph about Ganny. You captured him perfectly. I know what kind of mom lets her son do stuff like that - probably one of the best I've ever known (after my own of course). Helped make me a better person and I didn't even have to be her son. Having 4 children of my own, I've learned that each are very different in the way that they are "wired"..God has designed each so very differently. Thus, it is important to get to know each one of your children and learn what makes them tick. Then, you take each situation one by one and make your parental decisions based on the situation and the child. If your youngest enjoys jumping off a roof onto a pogo stick..great just make sure he has a helmet elbow and knee pads..you could do what conrad in the cat and the hat does and have him tape pillows and loaves of bread to his body to pad himself..lol..my point is we have to do the best we can and let god do the rest.